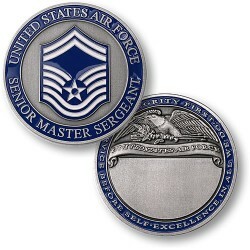 This coin honors the outstanding achievement of all Senior Master Sergeants, whose dedication and skill have earned them a distinguished place in America's Air Force. Minted in bold enamel on the coin's obverse is the Senior Master Sergeant rank insignia. The reverse has an open area suitable for engraving a name or personal message. Struck in a copper nickel alloy, this coin's rich antique finish is accented by colorful enamel highlights. Each coin comes packaged with a detailed header card that describes the contributions of Senior Master Sergeants to the successful completion of the U.S. Air Force mission. THIS ITEM HAS BEEN DISCONTINUED BY THE SUPPLIER.